In the past, building a multi-language website in WordPress was a relatively complex task. Today, it can be easily done with plugins that help you manage multiple languages in your site. In this guide, we will explain how to do it by simply using the Polylang Plugin. You don’t have to play with any code nor have any experience in it. Follow the steps below and you will find it easier than you think. We’ll only note that there are developers who claim that there is no point in using language plugins for multilingual sites, but instead you should install a WordPress MultiSite (MU), and create more than one site, all with different languages. But it depends on the kind of site involved. If you are running a site with lots of content, then the MultiSite method is more recommended. However, in many cases where there are only a few pages on the web-site, it’s much easier to do it from one single interface. It would be a shame to install another system, especially when Polylang can transfer the contents to another site with relative ease. The most important advantage: It doesn’t ruin the site after you remove it. So even if in the future you want to remove it, all the posts, categories and pages you have opened in another language – will remain. You will always be able to create a MultiSite and transfer any language to another site. 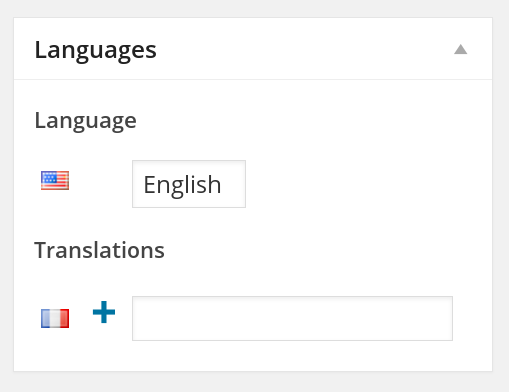 The following guide explains the WordPress installation adjustment to other languages, and how you can also add different languages in the WordPress installations. First of all, you need to install the Polylang plugin – by which we can open languages in the system and manage all the settings and change the interface language of the control panel. After installing and activating the Polylang plugin, go to the plugin page in Settings > Languages, where you’ll find the page where you can add a language. In our example below, we will add French to our website. Choose the language from the drop-down list and click the “Add New Language” button. The Strings Translation Page – where you can find all the widget titles, site title, tagline, date and time format so you could adjust them to the language. Generally, the widgets don’t have to be translated, because you can decide for every widget in what language it is displayed (there’s more on that later in the guide). The plugin takes the rest of the translation from the theme or plugin language files. So if you notice strings that aren’t translated on the site – it means that there probably aren’t any translating files for the language you picked in your theme or plugin. 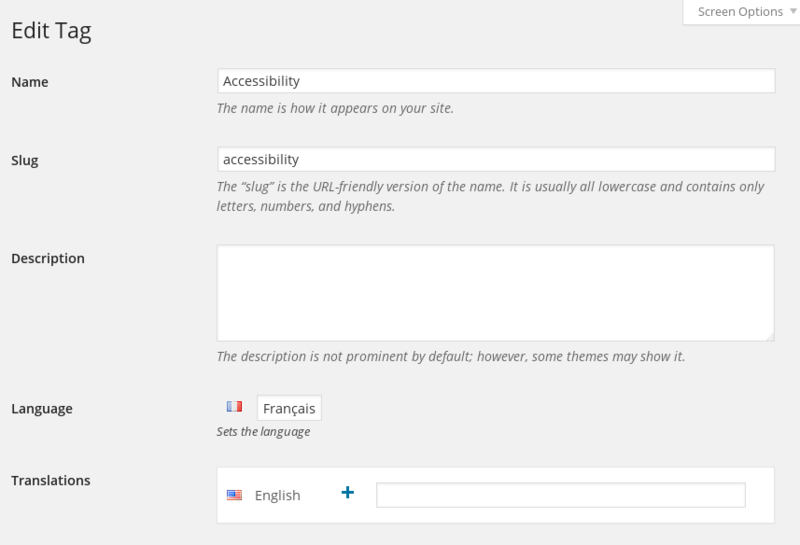 In the Settings page, you can control most website translation aspects and their management. Please note that immediately after the initial installation you will receive a comment in red. Don’t be alarmed. All you have to do is select the site’s default language and mark the checkbox: “There are posts, pages, categories or tags without language set. Do you want to set them all to default language?”. That way, all of your pages and current posts will automatically be set to the default language, and from here on you’ll only have to set the language for each post or new page. Since every subdomain and domain is dependent on your host server and also requires installation knowledge, we would recommend that you choose the second option. This way the whole link structure will be shown by the language you’ve chosen. In any case, these settings will work only if the link structure is not on default. In addition, choose “The front page URL contains the language code instead of the page name or page id”. Detect browser language: You can select “When the front page is visited, set the language according to the browser preference” – so users with a French browser will be brought directly to the French site and not in English. I personally do not prefer this feature because many French- speakers or other languages use browsers in English (especially in Mobile). Media: Activate languages and translations for media – this way a media modal will be displayed only with images that are associated with the language in which you write the post. It’s less useful because the images are usually the same in all languages. Custom Post Type / Custom Taxonomies: If your site has Custom Post Type or Taxonomies that came from the theme or any plugin, you can choose whether to run the translation in these areas. Taxonomies, custom fields, comments status, ping status, sticky posts, published date, post format, page parent, page template, page order, featured image. Note: If you are using a Pojo theme, don’t sync the custom fields because the Builder will duplicate itself. Finished with the Settings area – now on to the site’s content, to display all the options that can be done. Now you’ll be able to see on pages or posts all your items arranged by the language they were written in. This way in every new page you open you’ll find a meta-box where you can choose your preferred language / open a similar post in another language / see the other versions of the same page. In the menu area, you can automatically add to every menu its ‘Language Switcher’ and select the menu according to the language the user is using. In this screenshot we use the Pojo theme, in which you can also select a custom menu for the mobile version, so note that you can also change the Mobile menu according to the user’s language. You can choose to have any widget displayed in all languages or only in a specific one. This way you can fully customize the site to any language. In your personal profile area, you can choose which language to use in the dashboard, so you can fully control your WordPress installation. Particularly useful for sites with a few users who update the site. It is also possible to insert biographical information in two languages, which is particularly suitable for bloggers. As in the posts and pages, you can define categories, tags or other taxonomy in different languages. Note that for each category in French, a parallel English one can be selected, this way every post which you copy into the English version will automatically select the category in English. Now you have a website that is optimized for French and English. You can add as many languages you want, and you can do much more, like change the logo or add a different design or content for every language. You can read an orderly documentation on the plugin’s website. If you are using the WPML premium plugin, then you can also import the content from it by using a destined plugin. In addition, you will find a lot of plugins that support this one. The Pojo themes support this plugin perfectly. Using them, you can easily set up a multilingual website. 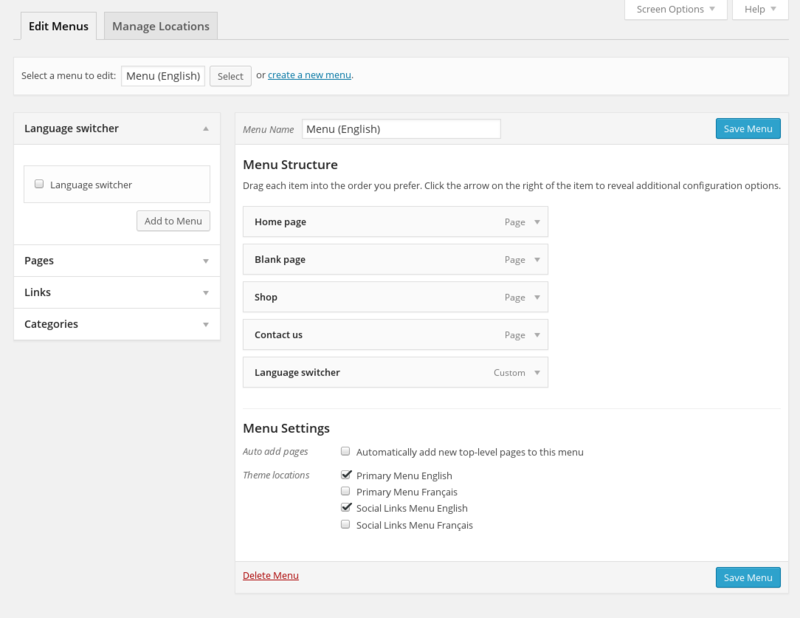 In addition, once you duplicate a page created with the Builder, all the widgets will be duplicated and you will only have to change the content language. Saves a lot of time, and a great amount of money. In our documentation area, you can find a guide on how to change the theme’s logo by every language while using Polylang. You’re welcome to ask questions or add insights. Hello! Thank you for your useful guides! WPML or Polylang for my -wannabe- bilingual travel and photo blog? I would use either WPML or Polylang, and translate only the Italian artices to English. Im thinking in use this plugin into my site, is possible to translate the permalinks? I recently installed this plugin and have run into an issue that I wonder if you could shed any light on. I have an English site I’m translating into German. When I’m on a page and select the German language from the language picker, the page changes to, say, http://www.site.com/de/product. The page is translated into German OK. However none of the links on the Menus link to the other German pages, they all link to the English pages. So on http://www.site.com/de/product the URL behind the link for the features page will be http://www.site.com/features which goes to the English page. This doesn’t seem right as then on each page you visit you would have to reselect the language you want to browse in. I haven’t seen a option to select a new URL (German one) when translating Menus. Surely your language selection should be carried onto all pages you visit for your session? Have I set this up wrong or is that how PolyLang works? I haven’t seen anyone mention this issue before.